Limousin breeders are being offered the opportunity to buy some fantastic pedigree bloodlines in a one-off special sale. Almost the entire Glenrock herd, based in Lockerbie, will be going under the hammer at Harrison & Hetherington’s Borderway Mart in Carlisle on Friday August 22. The unique sale will feature 35 cows served and/or suckling with 28 calves, six embryo calves, 19 heifers, two stock bulls and six young bulls. 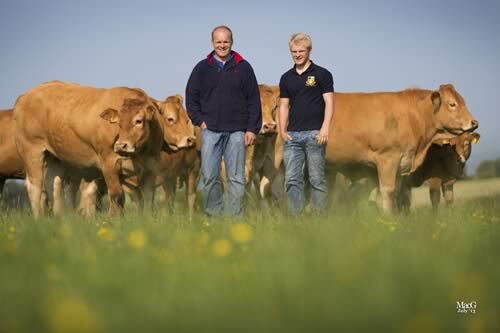 The Glenrock herd has been built up using the best Limousin bloodlines since it was started in Yorkshire by David Illingworth, a butcher who founded the herd in 1982 to maximise the best Limousin traits for pedigree and commercial farmers. Now run by David’s son Stephen, his wife Helen and their children Thomas and Victoria, the herd has been based at Howgillside Farm near Lockerbie since 1995. Stephen said: “We moved to Howgillside on a 20 year tenancy and we are delighted our landlords have given us the opportunity to purchase the farm before our tenancy ends. The Glenrock herd was initially established from two embryos from the Molva dispersal, which came from the same line as the renowned Limousin Broadmeadows Tansy, the grand dam of the famous bull Broadmeadows Cannon. The herd was built up by careful breeding and the judicious addition of occasional females such as Rachels Lesley (mother of Spangle) and Rudston Gwen (Rupee’s dam), plus a few selected embryos from France. The Illingworths have always sourced the best possible bulls and early sire influences included Oakley Politician, Crownhead Busby and the French bull Marquis, which resulted in a strong female line. Today, many of the foundation bulls’ granddaughters and great-granddaughters remain in the herd, which is dominated by the three female families of Juniper, Spangle and Saspirilla. Glenrock has focused on breeding bulls for both the pedigree and commercial markets, which are sold from the farm and at the main Limousin breed society sales at Carlisle and Stirling. In recent years, Glenrock Limousins have been shown at the highest level, earning Reserve Supreme at both the Royal Highland and Great Yorkshire Shows and champion herd in the North West last year. This year, Glenrock cattle won Reserve Junior Interbreed at the Royal Highland and Junior Champion at the Great Yorkshire Show. To round off a fantastic show season Glenrock Illusion has just won the Supreme Overall Championship at the Scottish Limousin Grand Prix at Perth Show. The Glenrock herd is member of SAC CHECS controlled health scheme monitoring for Johnes and BVD and is free from both diseases. Cattle are regularly vaccinated against BVD and are currently on four-year testing programme, with the most recent testing taking place in December 2012.